Vanuatu is an independent, democratic republic, with a non-executive president as head of state. The unicameral parliament, elected by universal adult suffrage every four years and with an element of proportional representation, comprises 52 members. The executive consists of a council of ministers, headed by the prime minister, who is elected by parliament from amongst its members. The prime minister is usually the leader of the majority party or majority coalition. Vanuatu’s thirteen government ministries are overseen by the prime minister and the council of ministers. The president is elected for a five-year term by an electoral college consisting of parliament and the presidents of the regional councils. Regional autonomy is promoted through six provincial governments. The district council of chiefs elects the National Council of Chiefs, which is consulted on customary law and traditional factors affecting government. In October 2004, parliament passed constitutional amendments designed to reduce political instability. These amendments included banning no-confidence votes in the first and last 12-month periods of a parliamentary term and, after the first 12 months of a term, required a by-election in any constituency where the member crossed the floor. Before taking effect these amendments were to be put to the electorate in a national referendum, which is still yet to be held. The judicial system comprises the Supreme Court, the Court of Appeal, the magistrates’ courts, the island courts and Land Tribunal. The Supreme Court is presided over by the chief justice; it has jurisdiction in civil and criminal cases and is the constitutional court. The magistrates’ court and island courts have limited jurisdiction in civil and criminal cases, and the Land Tribunal is concerned with land disputes. Judges are appointed by the president of the republic, on the advice of the prime minister and leader of the opposition (in respect of the chief justice) and of the Judicial Service Commission (the judges). The islands of Vanuatu, approximately 80 in number, have been inhabited since 500 BC, and the region was part of the Tongan Empire into the 14th century. The name ‘New Hebrides’ was given to the islands by Captain James Cook on his visit in 1774. During the 19th century French and British began to settle on the islands and in 1906 an Anglo-French Condominium was established. This administered the islands until independence in 1980, when the new name of Vanuatu was adopted. Elections in 1979 gave victory to the Vanua’aku Pati (VP), under the leadership of an Anglican priest, Father Walter Lini. After independence, the VP remained in power for 11 years under Lini’s leadership. In September 1991 Donald Kalpokas succeeded Lini as leader of the VP and as prime minister. The general election of December 1991 brought in a new government, a coalition led by Maxime Carlot Korman, leader of the francophone Union of Moderate Parties (UMP). From 1991 political life in Vanuatu has been characterised by coalition governments with fluctuating support and the splitting off of political parties. For instance, after the 1995 elections, Maxime Carlot Korman and Serge Vohor alternated as prime minister twice over. 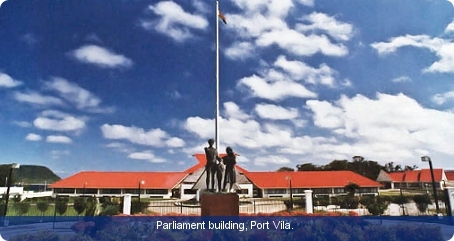 In 1997 parliament was dissolved and a state of emergency was declared following rioting in Port Vila. In December 2010, while abroad, Prime Minister Edward Nipake Natapei of the VP lost a parliamentary no-confidence vote, and the leader of the People’s Progress Party, Sato Kilman, was sworn in as prime minister.